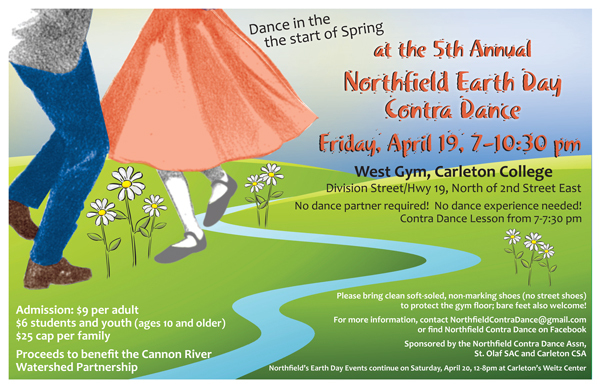 Hey, many of us are about ready try anything to bring it on…so, why not the 5th Annual Northfield Earth Day Contra Dance. No contra dance experience needed, free lessons provided from 7:00 to 7:30, or just come to enjoy the fun and listen to great music. We’re preserving the wood floor in the West Gym, so bring soft-soled, non-marking shoes or sneakers, or dance in your bare feet. Hey, if that doesn’t work to bring on the Spring, next weekend we’ll try dancing naked around a fire. Friday, April 19th: Chance Meeting, 5:00 to 7:00 p.m., Contented Cow; Tim Fast, 6:00 to 8:00 p.m., Hogan Brothers Acoustic Cafe; Cinderella, 7:00 p.m., Northfield Middle School Auditorium; Earth Day Contra Dance, 7:00 to 10:30 p.m., West Gym on the Carleton College campus; I Was a Rat!, 7:30 p.m., Northfield Arts Guild Theater; Why Not, 8:00 to 11:00 p.m., Contented Cow; Key West Rejects, 8:00 p.m., Tavern Lounge; and The Zillionaires, 8:00 to 10:00 p.m., Upstairs Rueb’N’Stein. Saturday, April 20th: Cinderella, 1:00 p.m. Northfield Middle School Auditorium; Kellen McMillen, 5:00 to 7:00 p.m., Contented Cow; Tuition Daddies, 6:00 to 8:00 p.m., Hogan Brothers Acoustic Cafe; I Was a Rat!, 7:30 p.m., Northfield Arts Guild Theater; Alison Rae, 8:00 p.m., Tavern Lounge; Optimum Trajectory, 9:00 to 11:00 p.m., Contented Cow; and The 8th Street Duo, 9:00 p.m. to 1:00 a.m., Upstairs Rueb’N’Stein. Sunday, April 21st: I was a Rat!, 2:00 p.m., Arts Guild Theater; Concert: Oratorio, 3:30 p.m., Boe Chapel on the St. Olaf College campus; and Quiz Night, 8:00 p.m., Contented Cow.